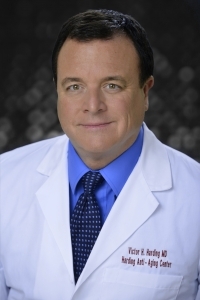 Dr. Victor Harding is Board Certified in Internal Medicine and certified by the American Academy of Anti-Aging Medicine and the American Academy of Sleep Disorder Medicine. He is also Cenegenics certified. He has an active preventive medical practice in Orlando, Florida, and utilizes the depth of this extensive training to improve the lives and health of his patients. In addition to seeing patients, he serves as Director of Research of the prestigious Harding Medical Institute. He is responsible for designing and conducting sophisticated research projects, studying various medical, hormonal, and sleep related topics. He has a special interest in obesity, cholesterol management, and cardiovascular problems. Dr. Harding is a graduate of Stanford University and the University of Virginia School of Medicine. He had his postdoctorate training at Florida, Southern Illinois, and South Florida Universities. He is a faculty member of the University of Central Florida Medical School and has presented research at national meetings of the American Thoracic Society and The Academy of Anti-Aging Medicine. Dr. Harding has been happily married for over 40 years to his wife Deborah Harding, MD, and they have six children and two dogs. Additionally, he loves to snow ski, and play golf. He regularly speaks on a number of motivational topics.